Life is rough in Colombia’s Eje Cafetero (Axis of Coffee) – not for us obviously, but more on that later. After spending just a week across a few coffee farms (fincas) in Colombia’s coffee growing region, I was hooked. So many different kinds of coffee headed to so many places across the world. The grower-to-distributor chains that have long been maligned as favoring free-trade over fair trade. The increasing market for “specialty” coffees, like Kona or Geisha. All of these aspects made my (second) favorite beverage exceedingly complex and climate change has come in to add further complexity to the mix. The majority of information in this post comes from an extensive tour of Hacienda Venecia, one of Colombia’s premier middle-sized speciality operations. Many of the visitors with us had extensive knowledge of coffee and the industry yet still remarked that it was one of the best tours that they had ever taken. So without further adieux, a little update on the state of the coffee industry. Coffee Type (Where it’s traded). The most prestigious variation of coffee and the one (almost exclusively) grown in Colombia’s Eje Cafetero. Washed Arabica is known for its lighter taste and lower caffeine concentration. The mountains of Colombia are moist and not conducive to air drying (the cherries will mold). Instead, Colombians developed an extensive washing practice that removed the outer husk from the cherries, “washes” them, and leaves a dry – but not roasted – bean for export. In the United States, we know almost northing else and everything from your gas station to Starbucks, to your Third Wave shop down the street is likely selling you so delicious washed arabica. In dryer climates, coffee farmers can skip the expensive mechanization involved in washing arabica and, in the method of the Peruvian coca farmer, simply leave the freshly picked cherries in their yards or on their roofs to dry in the sun. Led by Vietnam, which produces 20% of the world’s coffee, Robusta beans are popular throughout Asia and in cheaper coffee blends but are largely unknown in the US. 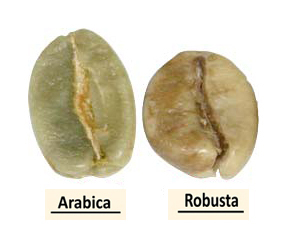 Robusta grows easily (like a weed) in the lower altitudes and thrives in hot, wet climates. It’s stronger immunity to pests and molds compared to its arabica cousin makes it a cheap and hearty crop for farmers. However, these same attributes give robusta beans nearly double the caffeine content (good) and double the bitterness (bad) of your typical cup of arabica. If you’ve ever had a solid cup of instant coffee, that was likely your only stateside brush with robusta. As everything noted thus far should lead you to believe, coffee can be a needy mistriss. The once-hardy weed first discovered in Ethiopia is now a maicured cash crop that requires constant care. Plants are tended to from the seed through their full production cycle, with constant pruning and relative management of water and sun. Unlike 90% of coffee farms around the world, Finca Venecia is picking their coffee beans/berries year round. Coffee relies on crazy weather (sun and rain at constant intervals) and Venecia has a lot of it. The tropical climate provides fairly stable temperatures year round that prevent freezes. The altitude (Finca Venecia sits 4,300 ft.) has provided cooler climes in which coffee thrives. While Brazil has engaged in mechanized picking on its huge plantations and even nearby farms indulge in strip picking (which involves removing all fruits from the plant despite of ripeness) Hacienda Venecia still has their laborers selectively pick only the red, ripe “cherries” off of the vines, checking for new fruit every 20 days. This method is more costly, like the washing process, but also ensures a higher-quality berry and a longer lifespan for the coffee plants. The laborers who pick coffee by hand receive payment by the kilo and the average laborer can do about 100 kilos per day, earning around US$15, which is paid out at the end of the six-day work week. Some on our tour remarked that this sounded like a pitiful amount for such a grueling week’s work. However, Hacienda Venecia’s staffer assured us that, combined with free room and board, their wages were better than average and could provide a solid living for their employees. Though Colombia has been one of the world’s top coffee producers for nearly half a century, conditions in the Eje Cafeteria are changing. With climate change, the more tropical northern reaches of the region – around Medellin – are seeing weather too warm to grow coffee. Lower altitudes stretching as far south as Cali are also witnessing problems. As Beatriz let on, this is not such a big problem for farms like Hacienda Venecia: they have diversified, converting their lower-elevation fields to banana, plantain, and other crops, while keeping coffee at the highest reaches. However, for small farmers with one or two hectares (who grow the majority of the coffee in Colombia) this change in climate can be a crippling blow to their coffee production. The experience in Colombia is nothing new. Coffee growing regions from Ethiopia to India have begun experiencing similar cuts to yields as a result. Even industry groups like the Coffee & tea Trade Association have begun to acknowledge the need for adaptation and mitigation strategies. A key diversification strategy employed by Hacienda Venecia and other similar fincas has been the introduction of tourism as a key revenue stream. Hacienda Venecia alone has three distinct guest accomodations (a main house, a guesthouse, and a hostel) that can accommodate more than 50 people at any given time. While we were paying just $10 per night in the nice but relatively basic hostel, guests in the main house paid more than $100 for extra touches of luxury, professionally pulled espressos, and a private pool. The Middle Ages gave us the Renaissance. The fifties gave us the sixties. George Bush gave us Barrack Obama. For every action there is an equal and opposite reaction and thus we have it with the shrinking yields in the Eje Cafetero. Decreasing quantities of beans for export are leading to farmers innovating to create higher-value beans with more distinct flavor profiles. Speciality coffees are nothing new. Kona Coffee from Hawaii ($35-50 per pound) has long been grown on limited patches of the islands’ volcanic soils. Geisha Coffee from Panama ($140 per pound) is known primarily for its rarity but is exceptionally sweet and more often brewed as tea than espresso. The most notorious is Kopi Luwak ($300+ per pound), which includes part-digested coffee cherries eaten and defecated by the Asian palm civet (consumers claim this process lowers the coffee’s acidity). Whatever the method of production, the rise of speciality coffee chains in the US and the increasing value of coffee growing real estate has left growers scrambling to occupy this space in the market. Test beans for Hacienda Venecia’s specialty coffee. With more and more of the farm lent to non-coffee crops, Hacienda Venecia is feeling the pressure to wring more value from each of its remaining coffee plants. That means a bigger investment in specialization. While our guide wouldn’t say much more, Hacienda Venecia is currently working on a “honey” varietal that would be designed for a distinctly smooth taste with a lighter roast (popular among hip coffee chains like Blue Bottle and Intelligentsia). The hope for this new bean would be to grab a percentage of the speciality coffee market and allow the ever-shrinking share of Hacienda Venecia’s land that is devoted to coffee to claim as much as five to 10 times per hectare what it is now. Whatever the outcome for Hacienda Venecia, the threats posed by climate change to Colombia’s coffee farmers is only increasing – a dangerous trend for a country that has spent countless (US) dollars incentivizing its farmers away from coca to other crops. Innovative farms will be able to specialize or diversify but the smallest farmers, who grow the vast majority of Colombia’s coffee, will not. If governments, coffee corporations, or federations are not able to do something, we may be missing something far more iconic than Juan Valdez – our Colombian dark roast.